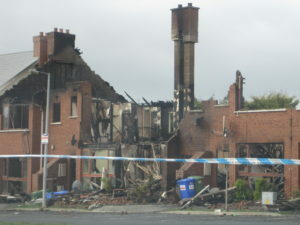 A fire started in one house in a terrace of 6 in Newbridge, Co. Kildare last night. The results were devastating for the owners and occupiers. 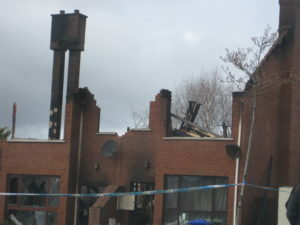 When the Garda forensic invesigation is over the properties will be handed back to the owners. The insurance companies will appoint Loss Adjusters to handle the claims on their behalf. They may appoint their own forensic investigators. During the past 20 years there have been many timber framed estates built in Ireland. Built with an inadequate fire-break between each housing unit at roof level, that allowed the spread of the fire to the whole terrace. Who owns what? Landlords/owner occupiers are responsible for the buildings and all built-in fixtures and fittings and their contents. Tenants are responsible for their contents. Who is liable? There is no liability for the spread of fire unless negligence is proven i.e. it is up to each owner to insure their own property. 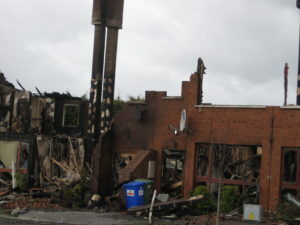 If the arsonist is caught and ‘is a mark’ there could be a recovery action. Who will pay for the cost of alternative accommodation or loss of rent? A tenant will have to find alternative accommodation and pay rent elsewhere. If they have contents cover it may cover any extra cost incurred in securing alternative accommodation for 12 months If an owner occupier has insurance there is generally cover for alternative accoomdation up to a percentage of the total sum insured on buildings to cover the period necessary to reinstate the property. A landlord similarly will have cover for their loss of rent. What is required to process a claim? A full Bill of Quantites will be required to detail the cost of rebuilding, including demolition, debris removal and professional fees. A full inventory and cost of replacment of all contents will be required. 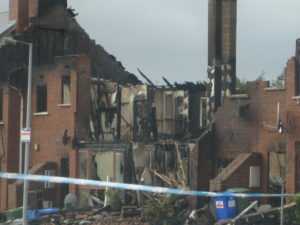 How will the properties be rebuilt and how long will it take? The properties are effectively combined and will need some co-ordinated approach to re-build them in one go. It would not be feasable to rebuild one of the mid-terrace houses in isolation. The houses will have to be re-built to comply with current building regulations and Insurance policies cover any additional cost in doing so. The process may take a year or so if everything can be co-ordinated and there are no hitches with funding being available etc. How do I make a claim? 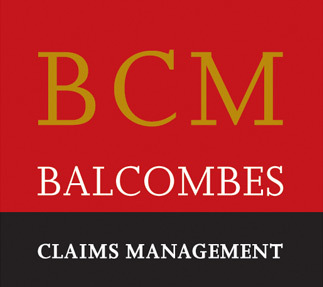 Having a Loss Assessor to assist you to compile submit and negotiate your settlement will ensure the most effective way of creating a fully documented statment of claim and ensuring a speedy and cost effective way of dealing with it. We have expertise in what is required to validate the claim and make sure it is presented correctly. We have vast experience is dealing with the myriad of questions and uncertainties that will be encountered and are there in a supporting role to help ease the stress of the situation.